Elegant and mesmerizing, Frances Hodgson Burnett’s The Secret Garden is a beautifully written children’s novel that remains to hold incredible value in the world of literature for over a century. When Mary Lennox is sent to live with her estranged uncle after the loss of her parents, the life she knew vanishes and becomes full of strange happenings and peculiar secrets. Vibrant in both setting and writing style, Hodgson Burnett’s classic novel brings to light the importance of imagination and life. Will Mary unlock the secrets within Misselthwaite Manor? What magic lies beyond the walls of the Secret Garden? This 100th anniversary edition of The Secret Garden celebrates a cherished classic with Tasha Tudor’s wonderful illustrations throughout, an extended author biography, games, activities, and more! Growing up, I had two favourite movies: The Secret Garden and A Little Princess. It wasn’t until middle grade that I realized these were both originally books and they were written by the same author. Funny how that works. Later, I did a book review on The Secret Garden for a language arts course in Grade 7. I remember enjoying it, especially the language and the beauty of the garden. For some reason, I thought I would re-read it this year; pretty sure it had to do with the POPSUGAR reading challenge. So, what did I think after having read it over a decade ago? The Secret Garden is a beautiful story expressing the need to appreciate life, growth, imagination, and the innocence of childhood. Her writing made me feel this nostalgia from the days where believing in magic was as simple as walking and playing in nature was the biggest adventure known to a child. Looking back, I’m pretty sure this is why I loved the book so much. I LOVE when literature reminisces on simpler days, especially since North American society seems to be on a treadmill that’s set to a constant running speed…never slowly down to just take a breathe. Hodgson Burnett’s story is a true children’s classic, focusing highly on the importance of developing one’s imagination and living out in the world rather than hiding in the safety of one’s own home. It’s a simple story, but with an immense amount of power and meaning behind it. Though there is little action and a rather small “climax” in comparison to other coming of age children’s novels, I argue that this book draws more meaning on life and childhood experiences than most other pieces of children’s novels to date…or any literature for that fact. It’s probably why it’s still so popular in both book and film format to this day. People feel this essence, even if they can’t describe it or comprehend why The Secret Garden makes them feel this way. I also found the story slightly repetitive. Yes, I love the focus on the garden. But seriously, can we just add a little more to this or can we make the book shorter? I feel as though this story would’ve been better if there were about 100 pages less…but that’s just me. You know when you read a book and you can’t remember the characters, sometimes wondering why they were even added in the first place? I NEVER felt this with The Secret Garden. The characters were really fascinating, each with their own little backstory and unique quirks. It made it extremely easy to remember the characters! What’s more wonderful is the character development, especially with Mary Lennox and Colin Craven. The two main protagonists are not really the most likable at first…honestly, they’re brats. If they were my kids, we’d be having some serious talks. As you learn the types of lives they’ve lived though, you realize it’s no wonder they turned out this way. However, their growth in the novel is astounding! Starting as spoiled and miserable children who wouldn’t know how to smile if you showed them an image with detailed instructions on how to smile, grow to become rather enjoyable and rambunctious children. Dickon, my favourite character, is probably the most likeable character in literature to date. An animal tamer and lover of nature, he helps both Mary and Colin tend to the garden and demonstrate what it’s like to truly be a child. The three together create a great dynamic, providing a well-balanced set of main characters. The others don’t show as much development, but they certainly aid to the story. What I found most interesting is the relationship between the character development and the garden; as the garden grows, so do the children in imagination and exploration and simply living life. They feed off of one another, showing a strong symbolism to the meaning of life and one’s own development for the better. THIS was something I found to be tremendously powerful and meaningful to not only the characters, but the story itself. The strongest part of The Secret Garden is Hodgson Burnett’s writing style…it’s beautiful! The elegant writing and attention to detail to describing the setting is profound; I don’t think this book would have been such a success if she wasn’t able to write so wonderfully. It’s overly descriptive, which I think’s what caused me to pause a lot and take breaks; but the language is lavishly vibrant, reflecting the beauty of the garden itself. You don’t need a big imagination to see the garden Hodgson Burnett is describing in the book as she paints it perfectly for you. If you’re a fan of nature focused poetry, you’ll most likely enjoy this novel. 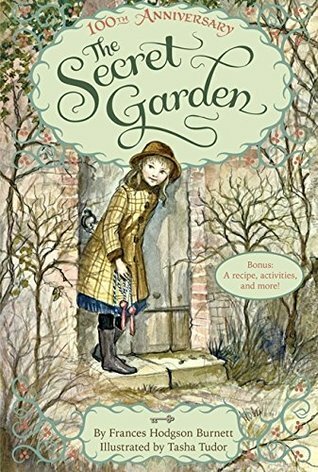 Overall, The Secret Garden was a fun read that really brought back some fun memories of my days playing in grandma’s garden and exploring thousands of worlds simply by imagining them. However, the pacing is incredibly slow, which caused me to lose interest rather frequently. Additionally, I got incredibly tired of the constant India bashing; it diminishes later in the story, but note that you’ll read quite of bit of racism towards the culture of people of India in the first half of the novel. Beyond those elements, the book is astounding in meaning and symbolism, greatly focusing on the use of elegance and beauty to pull the reader in. Want to add a classic to your TBR list? Maybe give this children’s novel a shot. I loved this book growing up, but I totally agree with you on its slowness. I tried to reread it a few years ago but it was hard for me to read for long periods of time! Great review! The gifs are great 🙂 I’ve never read the Secret Garden, but I would love to read some of the author’s use of description. Shame about the racism, though. I loved the book! I remember that the movie adaptations of both A Little Princess and The Secret Garden originally scared me as a kid – I was easily frightened when I saw conflict, trauma, or injury. Great review! Me too! My mom really had to watch out with what I watched. She said I got so attached and then I’d cry because I couldn’t help…such an odd kid lol! I’m glad you enjoyed it! Thank you! I really appreciate it! It’s definitely not a one day read haha! Perfect as a one chapter a night book!